Jewelry stores are like wonderland for women. The wish to own shiny jewelry is found in every woman. However, women are not attracted to all jewelry stores. Ever wondered why? The answer is very simple. Because the jewelry is not well displayed. No matter how cool the designs are, how less the prices are and how beautiful the packing is, if the jewelry is not displayed in an organized and presentable manner, women will not consider buying it. This is when the need of jewelry displays become inevitable. Jewelry displays are the best way to make your jewelry look fine. The necklaces, rings, anklets, bracelets and rings look a lot better in display stands. Many women are out in the market to look at the jewelry and if it looks captivating, they consider buying it. No one goes from shop to shop to take a look at the showcases and check individual jewelry. If the jewelry is displayed in jewelry displays, there are maximum chances that it will sell faster. 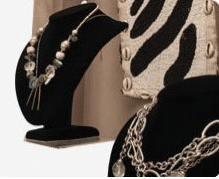 Wholesale jewelry displays make your jewelry store rock hard among the competitors. You should choose the one that suits your jewelry. These stands come in various colors and shapes for different kinds of jewelry. Some of the best jewelry displays are necklace easels, metal necklace displays, ring cases, ring displays, rotating stands for bracelets and slatwall displays. These displays come in affordable prices when purchased in wholesale. Jewelry displays add a lot of beauty and grace to your store and make your outshine your neighborhood stores. If you want to know more about these displays, contact us now. Our staff can also help you choose the best displays for your store.